Over the course of the year, L.A. Filmforum will present screenings that reflect the the turbulent global events of 1968 from the assassinations of Martin Luther King, Jr and Robert Kennedy to the Democratic Convention and 1968 presidential election in the US, to the strikes in France in May and the Prague Spring and Soviet crushing of it. 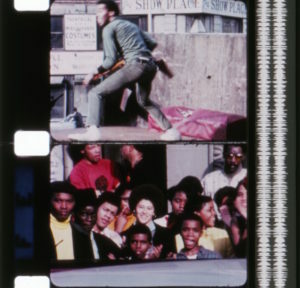 The series’ first screening looks at the Black Panthers and their actions in Oakland, through their own film, and through the view of an sympathetic observer, Agnès Varda. Two lesser known works remind us of the cultural and student actions of the year. San Francisco State: On Strike covers the student efforts, led by students of color but joined by the full spectrum, to expand the educational possibilities at a state university. And in Newark, New Jersey, Amiri Baraka (then LeRoi Jones), made an experimental documentary of the theatrical and political actions of African-Americans in the city that year, The New-Ark. The curators are Alison Kozberg and Adam Hyman. 1968, 16mm transferred to digital, color, sound, 28 min. 1969, b&w, sound, 14 min. A film that the Black Panthers used to promote their cause. 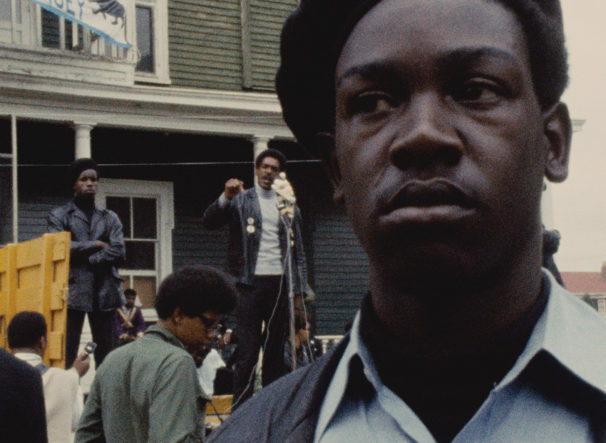 Shot in 1969, in Oakland, San Francisco and Sacramento, this exemplar of 1960s activist filmmaking traces the development of the Black Panther organization. In an interview from jail, Minister of Defense Huey P. Newton describes the origins of the Panther Party, Eldridge Cleaver explains the Panthers’ appeal to the Black community, and Chairman Bobby Seale enumerates the Panther 10-Point Program as Panthers march and demonstrate. 1969, b&w, sound, 20 min. In many ways, multicultural education can be traced back to San Francisco in 1968-1969. In one of the most high-profile student actions of the 1960s, students at San Francisco State University went on strike, shutting down the campus for six months. University president S.I. Hayakawa called in the police, who busted heads and arrested hundreds in an attempt to restore control of the campus. But the strike didn’t end until the school acceded to student demands and created the first ethnic studies department at an American university. This film, shot by the students and their allies, is a classic primary source document of the 1960s. 1968, 16mm transferred to Blu-ray, color, 25 min. Amiri Baraka (formerly LeRoi Jones) was commissioned by the Public Broadcast Laboratory of National Public Television to make a documentary, and he bravely set out, along with cinematographer James Hinton, to document Black Power in Newark, New Jersey. The film focuses on black education, urban public theater and political consciousness-raising inside and outside of Spirit House—Baraka’s black nationalist community center. Lost for years and recently rediscovered at Harvard in 2014, The New-Ark was restored and preserved by the Harvard Film Archive.